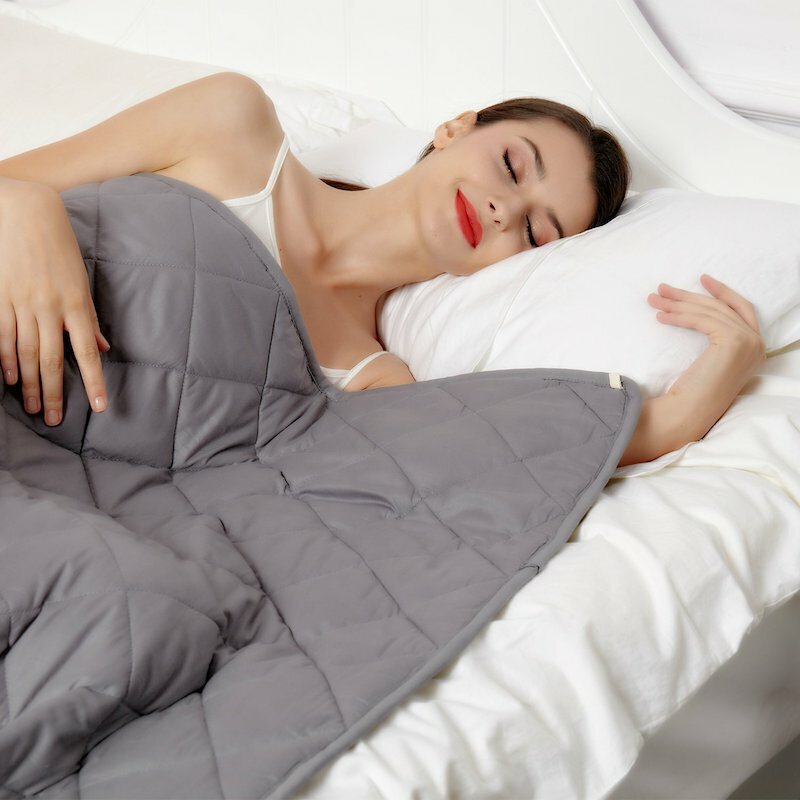 1 Hypnoser Weighted Blanket Review: How Does it Work? 4 Hypnoser Weighted Blanket: How Effective is it? The hasty modern world we all live in makes most of us feel physically and mentally exhausted. If we want to be happy, we need to be rested, and that means that sleep is essential for our happiness. Unfortunately, sleeping disorders are in the steep rise. It seems that we all need to alter our lifestyle to support healthy sleep. First of all, we need to relax before going to bed and create a pleasant sleeping environment. 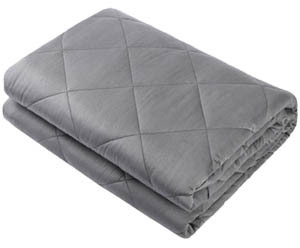 A weighted blanket is a good option for calming ourselves down when we have trouble sleeping. The gentle pressure of such comforters is, in essence, a sensory input to our brain that leads to the release of serotonin- aka our happy hormone. Serotonin is a hormone that relieves stress and calms us down, and can, therefore, help us sleep better as well. 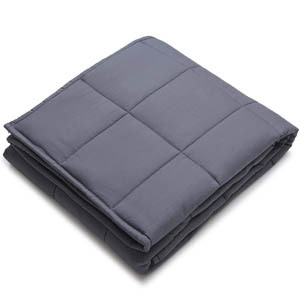 I have tried numerous weighted blankets by now, and I can honestly say that most of them helped me battle my anxiety attacks and sleep more peacefully. If you want to experience drastic improvements in your sleep pattern, you should try using weighted comforters as well. There are numerous weighted blankets to try out, or you can just read my honest reviews and benefit from my experience. Today I will review the Hypnoser Weighted blanket, a budget-friendly option which is considered to be one of the best deals you can currently get. Is that really so? Read on and find out! Hypnoser Weighted Blanket Review: How Does it Work? You probably already know a lot about weighted blankets since you are searching to buy one for yourself. Some of you may even have had one recommended by your doctor – it happens quite often these days. Why are they becoming increasingly popular? I believe that the reason for their popularity lies in the fact that there are almost no complaints from the people who had already bought them. The scientist and doctors that speak in praise of the weighted blankets help a lot as well. How does the weighted blanket work? In the simplest words, it simulates a hug, and there is not a single person in this world that does not feel better when he or she receives a hug. A hug provides us with a sense of security and calms us down. The Journal of Sleep Medicine & Disorders has published a recent study that confirms the connection between weighted blanket usage and tackling insomnia. All the study participants who have used the quilt reported better sleep quality. They felt it was easier for them to fall asleep, and they could stay asleep for longer. All the quilts share the same principal- they use the weight of heavy materials to trigger deep touch pressure. The Hypnoser weighted blanket is no different: it features extra small diamond pockets that hold the hypo-allergenic glass beads and distribute the weight evenly. There is almost no wasted space as these pockets are sewn close together – this means that you will feel the weighted pressure all across your body and feel relaxed more quickly. It would be best to get a custom made weighted duvet that meets your needs perfectly. Unfortunately, most of us will end up buying a weighted blanket in a store or online. 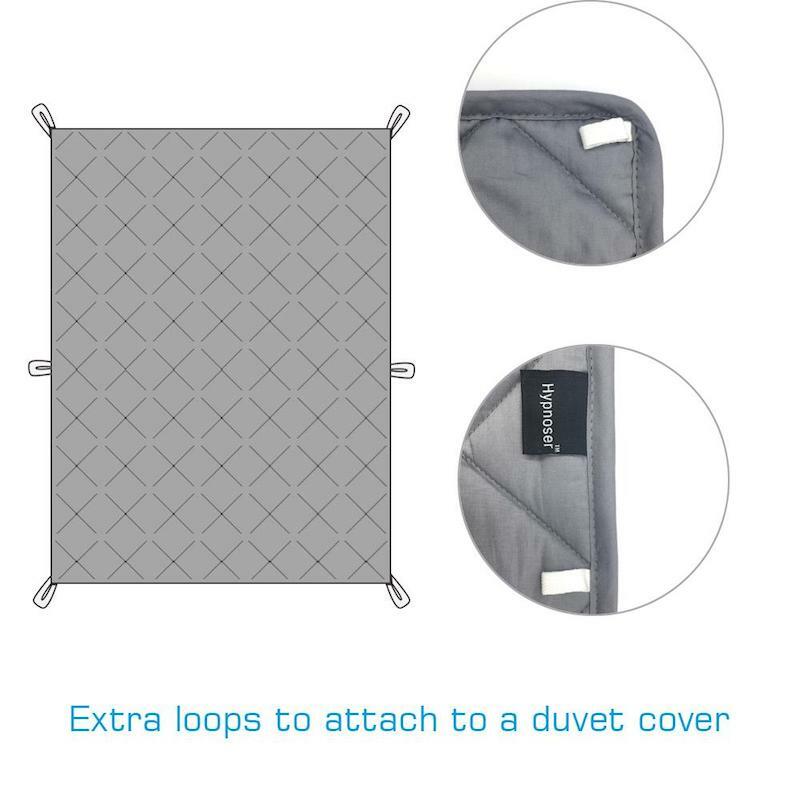 It is hard to have all our needs meet when you have to purchase a prefab weighted blanket but Hypnoser company has tried to provide you with different options, and the good news is that their comforter is suitable for both adults and children. When it comes to size and weight options suitable for kids, you can choose the smallest quilt which measures 48″ x 78″ and comes in three different weights 15 lbs. , 20lbs., and 25lbs. 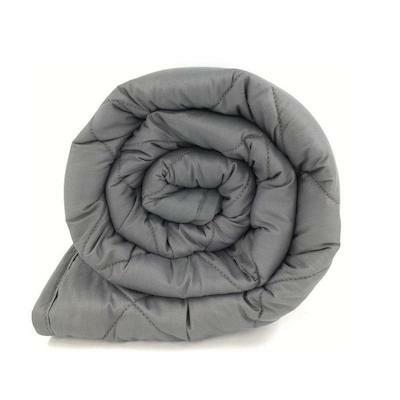 The medium size blanket measures 60″ x 80″ and comes in four weights: 15lbs., 17lbs., 20lbs., and 25lbs. Finally, there is the largest quilt that measures 80″x 87″ and comes in two weight options of 25lbs and 30lbs. This is quite a satisfactory range of sizes and weights, and I am especially surprised to see a 30 lbs. weighted blanket as it is a true rarity. If you are wondering which of these blankets suits your constitution best, you should know that Hypnoser recommends buying the one that weighs approximately 10% of your total body weight. When it comes to color options, they are scarce, to say the least. You can choose from three colors: Navy Blue, Dark Grey, and Light Black. All the options are rather dark, and although they do look elegant and luxurious, people (mostly kids and teenagers) who prefer brighter colors might be disappointed. The Hypnoser blanket is made from breathable natural cotton inside out- and that is the best bedding material out there. Cotton is not only comfortable- it feels great on your skin and allows it to breathe. It will never make you sweat or feel hot, and, if properly maintained, it will last you for ages. The weight material is a bit surprising though, especially in this price range- it is glass. The sand glass is an excellent choice for many reasons but most of all because it distributes the weight more evenly than any other material and it is much quieter too. It is also hypoallergenic, which is especially important for allergy prone children and adults. Sandglass has one fault though – it cannot be dried in the drier which leaves you with a time consuming air-dry option only. Luckily, the blanket can be washed in the machine. You need to buy the cover separately and although you might think that you can manage without it, owning one will make your life much easier. The cover is there to protect your blanket from both staining and wear and tear. It is also much easier to wash and dry the cover than the entire heavy quilt. Hypnoser covers are quilted, made from organic cotton or microfiber and feature an easy-to-use zipper. They are all machine washable for easy maintenance too. Hypnoser Weighted Blanket: How Effective is it? The Hypnoser weighted blanket might be a prefab comforter made in China, but it delivers where it should- it helps to alleviate insomnia, fatigue, and anxiety. I believe that the use of sand glass is a real masterstroke and makes this quilt stand out. 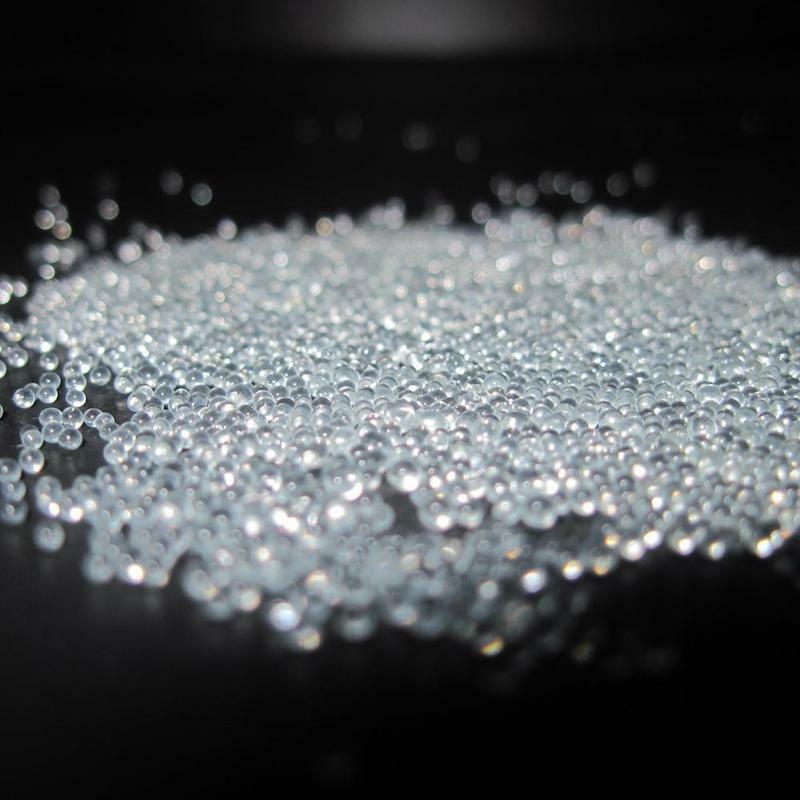 I have tried many filling options from plastic pellet to metal beads, and I can honestly say that glass beads are my favorite. 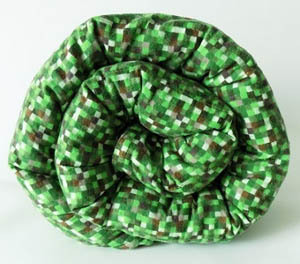 Unlike most weighted comforters that are stitched with a box pattern, the Hypnoser blanket features a unique diamond pattern to keep the filling in place. The sleek design does not scream therapeutic use, and it can, therefore, be used both at home and when traveling. The stitching enhances the positive effects of the Hypnoser weighted quilt too. There is no empty space, and thus the weight is distributed evenly, and the effects are maximized. Hypnoser weighted blanket has its strengths and weaknesses. I vote in favor of this comforter not only because of the comfort and peace it has provided me with but also because it is made of 100% breathable pure cotton and sand glass filling. The good news is that you will receive a standard 1-year limited coverage with your purchase. The bad news is that it covers for factory faults only and offers an exchange only- no reimbursement. The warranty might be less than stellar, and the price is not on the lower end either, but unique design and material choices make up for all of that. Speaking of the price, I must stress that those weighing in the 300lbs range will be the most unpleasantly surprised as the largest, and the heaviest blankest are the most expensive as well. In fact, if you need the largest sized comforter, you will be better off getting a custom made one. Even though Hypnoser has its faults, I am sure you will be happy with your purchase. Therefore, if you fall into the weight and size range, and you tackle issues weighted blanket could help resolve, you should give Hypnoser a try. I believe it is worth it.